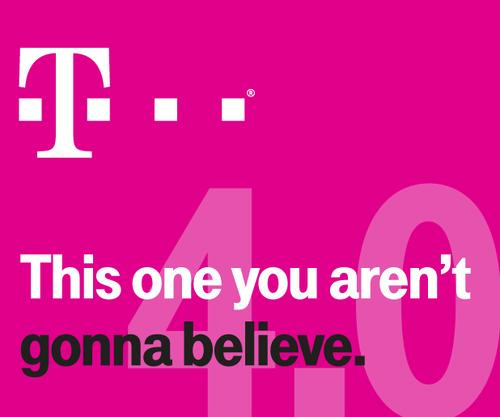 T-Mobile USA looks set to reveal the next step in its "un-carrier" plan at January's CES in Las Vegas. The number-four carrier sent invitations to reporters Friday for a CES news conference Jan. 8. "This one you aren't going to believe," the invitation read over the number "4.0" in the background. T-Mobile has been using such numbers to refer to successive iterations of its business strategy, dubbed "un-carrier" by CEO John Legere. Legere is seeking to boost T-Mobile's share of the U.S. market by attempting to woo customers with pricing and services that are different from its bigger competitors: AT&T, Verizon and Sprint. So far, the company has simplified pricing plans, done away with phone subsidies, begun offering free international data roaming over 2G networks and said it will offer 200MB of data per month over its 4G LTE network at no charge to tablet PC users who sign up for a Mobile Internet account. No further details of the company's CES announcement were immediately available. In the last week, several news reports said number-three carrier Sprint is considering an acquisition of T-Mobile USA. Sprint was acquired itself earlier this year by Japan's SoftBank.